It isn’t just for my line of work. With the Pixel Slate running Chrome OS launching soon and poised to compete against the Microsoft Surface Pro and other related hardware, it’s a wonder if it can replace the full-throttle laptops that working professionals and creatives have long relied on. At a base price of $600, the Pixel Slate doesn’t seem like such a bad deal. It’s the higher-end models—the devices equipped with Core i7 processors and 16GB of RAM—that make me wonder if a Chromebook is worth upwards of $1600 because it still can't do everything else a Mac and PC can. Sure it says "My Files" in the File Explorer. But when you dive in it's really just a shell for the Downloads folder. When you're using a Chromebook, basically all of your files end up in the Downloads folder. This can be confusing when you're downloading large batches of files from the web, or you're trying to extract a ZIP archive. The Downloads folder needs major rebranding—"My Documents" would be just fine, or even "My Stuff."' 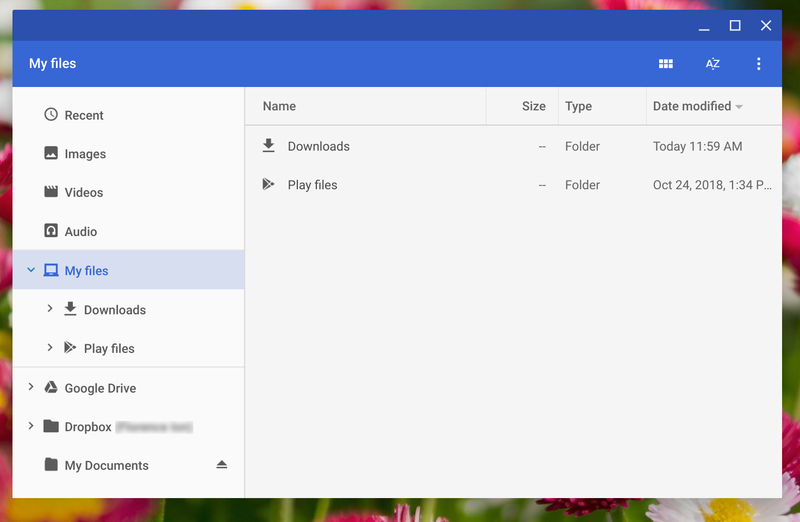 It's also too much of a relic of Chrome OS's Android past, and with Chrome OS attempting to go forth as a Mac or PC rival, it needs a real file directory. The other annoyance is that you don't always know where you can copy and paste files. Because Chrome uses Android's file directory schematic, only some of the folders allow Write access. Chrome OS won't feel fully desktop-like until it provides the type of drag-and-dropping that Mac and PCs do between folders. Despite its cloud-based nature, not everyone wants to store their files into Google Drive. There's a reason this tool has such a low rating. It rarely works. I was happy to learn that I could tether my old hard drives to the Pixelbook to transfer over media files, text files full of early poetry, and my Livejournal archives. Though that quickly turned into a frown when I attempted to add some of the media files to the family Plex server, which is on a Windows machine. 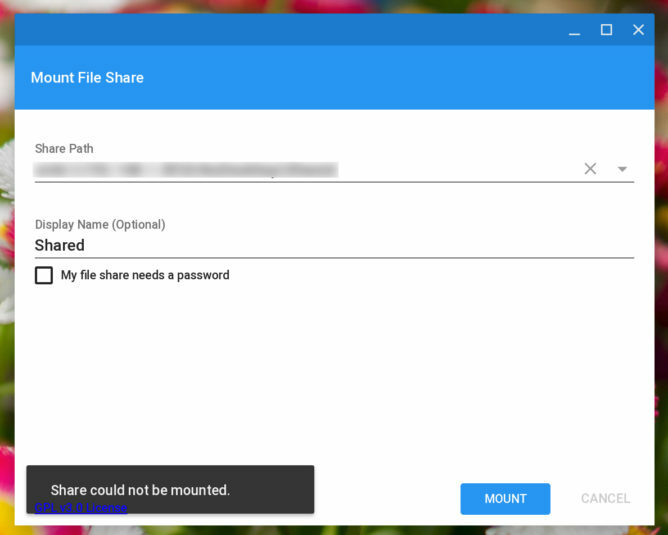 I couldn’t get it to work with the Google Network File Share extension or third-party extensions like File System for Windows. And though Chrome 70 was supposed to bring with it native network file share support, it's not exactly viable yet. 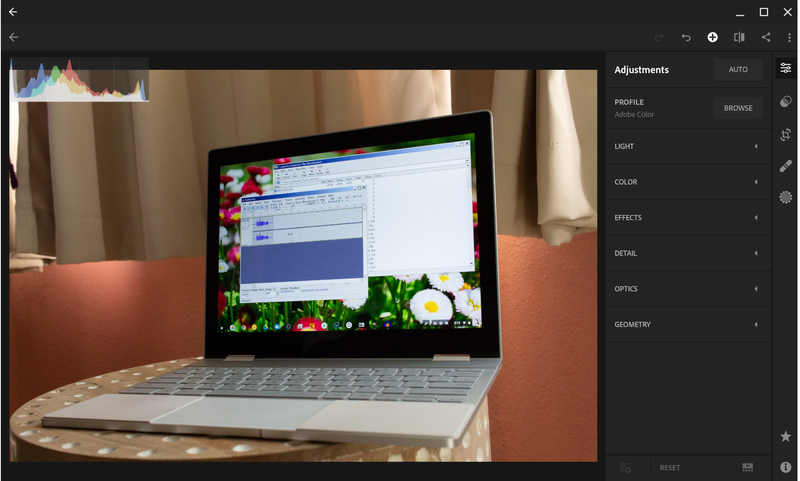 Adobe Lightroom for Android is fine but it's lacking some essential features that power users need. Is it too much to ask for the full suite of Adobe Creative Cloud? Surely, a device like the Pixelbook with 8GB of RAM would be capable of running the full desktop versions of Photoshop and Lightroom. The Lightroom that’s available for Android is sufficient enough, but it’s missing key features like batch editing and watermarking, which I heavily rely on for processing photos. And though I appreciate the ease of the Creative Cloud library integration across platforms, I wish there was a version of Photoshop for the Chromebook that worked exactly like on the PC or Mac. My gripes aren’t just limited to Adobe’s family of apps. There are other applications that I rely on where I haven’t found a Chrome extension or an Android app to get the job done. Microsoft Office, for instance, does not exist the way it does on the Mac or PC, so I have the hardest time editing and submitting documents because I don't often have compatible software. Speaking of full-blown apps, I’d like to see some Windows ones! Android apps like Crossover are great for getting small PC apps up and running on the Chromebook. But because of the emulator’s 32-bit limitations, essential apps like Microsoft Office and Adobe Creative Cloud won’t run on Chrome OS. And though there are Linux-based equivalents that can run on the best of the Chromebook models available, it’s seriously not the friendliest for ordinary users. I want to be able to download an .exe file, click it to install, and move on with my life. Two windows, side by side. That's often the extent of multitasking on Chrome OS. 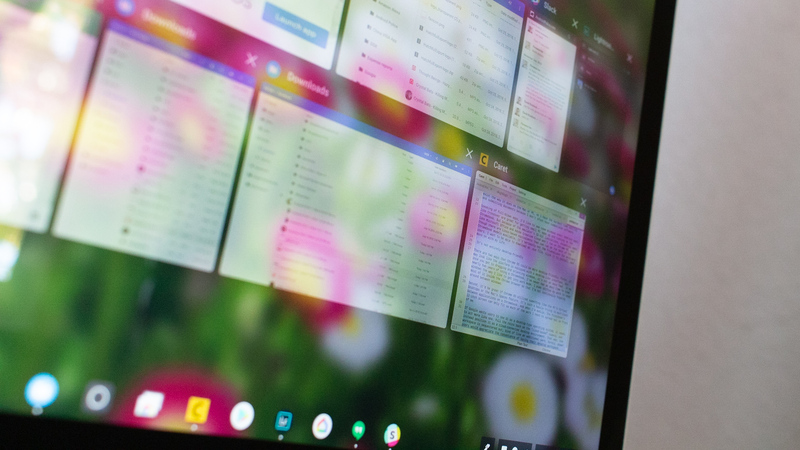 There are two ways that Chrome OS could be more desktop-friendly. First, it may look like the platform is equipped with a desktop-like interface, but once you get to dragging and orienting windows, it's not an easy feat. In my nearly two years of using a Chromebook, I've never had an easy time to snap windows the way I like to get into work mode. I even shifted my work to keep most of it inside the Chrome browser so that I’m not continually hopping around between windows. Second, it'd be great if Chrome OS utilized something like the PC's Virtual Desktops or the Mac's Spaces feature. 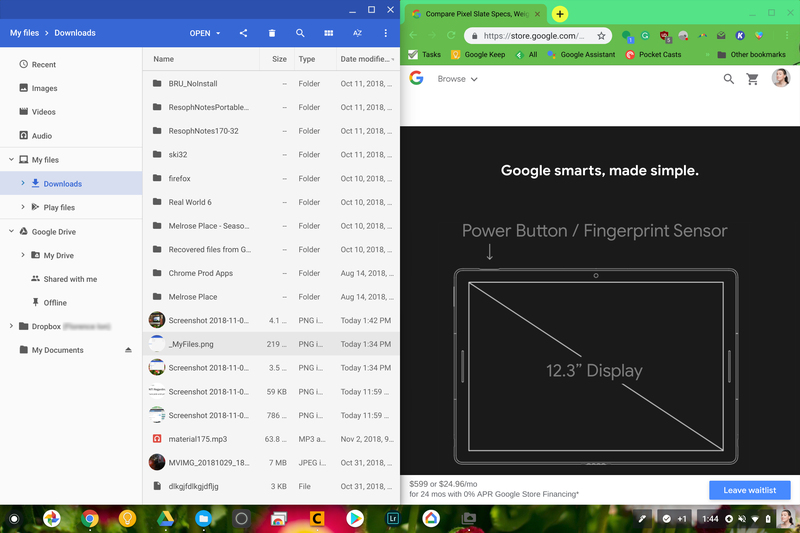 It's such a hassle trying to multitask between applications on a Chromebook. And when I'm mobile, the Pixelbook's 12-inch screen can only fit so much of the work I need to spread out in front of me. If Google wants users to see it as a desktop-type operating system, it needs to act more like one. Pull the reins back on the "cloud-based" nuance, and instead position it as a cloud-connected desktop environment. That way, the workspace is sequestered out, kind of like an additional perk. Surely, power users would appreciate the convenience of having their desktop workspace saved in the cloud, roaring and ready to go whenever they are to get some work done.